Where to find Marbella hotels near an airport? How can I find hotels in different Marbella neighborhoods? Where can I find hotels in Marbella that are near tourist attractions? 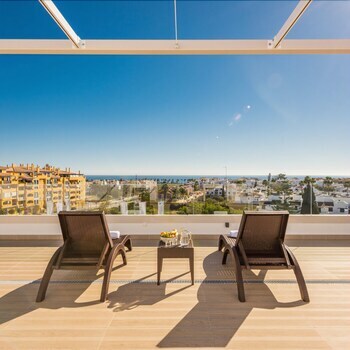 Travelers can discover an extensive range of short- and long-stay accommodation options to select from in Marbella. You can search 61 hotels within 0.1 kilometres (0.06 miles) of Marbella's downtown on our informative and up-to-date booking pages. Why not book a convenient spot close to Marbella's heart? The Hotel Claude Marbella and Hotel Fuerte Marbella can be found 1 kilometre (0.6 miles) of the city center. The Expedia team appreciate that travelers possess varying budgets and needs. So if you're looking for somewhere to base yourself at the budget end of the spectrum, the Marbella area offers some nice options to choose from. The Globales Pueblo Andaluz is 9 kilometres (5 miles) from the heart of Marbella, while the Alanda Club Marbella is 10 kilometres (6 miles) away. 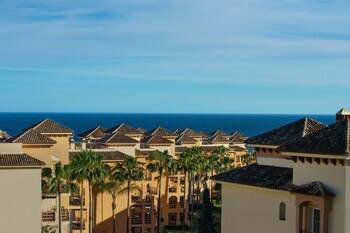 Two other options in the cheaper range include the Barcelo Marbella and the Hotel PYR Marbella. The Marbella Club Hotel Golf Resort & Spa is situated 3 kilometres (2 miles) away from the main part of Marbella. Another alternative is the Puente Romano Beach Resort & Spa Marbella, which is situated 4 kilometres (2 miles) away. 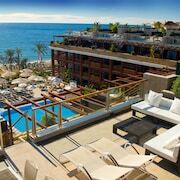 The Villa Padierna Palace Hotel and the Gran Melia Don Pepe are two alternative accommodation options worth checking out in Marbella. Benalmadena is 30 kilometres (18 miles) to the east of Marbella and is where you'll find Sea-Life and Plaza de Espana. Should you wish to spend a night or two in Benalmadena, check out the Holiday Polynesia and Holiday Hydros. 40 kilometres (24 miles) to the northeast of Marbella, you can also stay at Churriana, which is home to the Riu Belplaya - All Inclusive and Marconfort Beach Club Hotel - All Inclusive. The Malaga Airport Museum and Desembocadura del Guadalhorce are a couple of the popular sites to explore when visiting Churriana. Before you leave Malaga, make sure you experience some local sport. Visit Plaza de Toros to the southwest of Marbella. Those sports fans wanting to find a bed near to the action can choose from the Gran Hotel Elba Estepona Thalasso & Spa or the Hotel Fuerte Estepona. Situated 40 kilometres (25 miles) from Marbella is Malaga Airport. 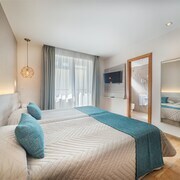 Stay nearby at Sol Principe or Parador De Malaga Golf. What are the most popular Marbella hotels? Are there hotels in other cities near Marbella? What other types of accommodations are available in Marbella? Explore Marbella with Expedia.ca’s Travel Guides to find the best flights, cars, holiday packages and more!